I am an extraordinarily lucky woman. 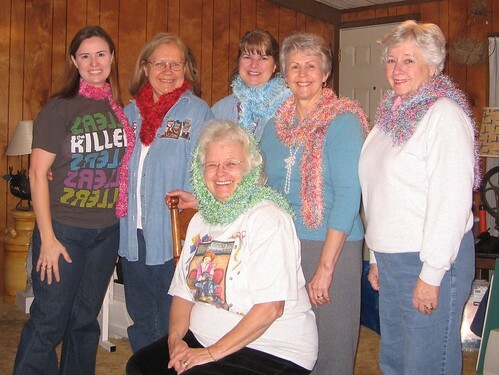 Every year, I go with my group of quilting friends for a long weekend of sewing, eating and giggling. We join forces in a house by the lake and leave the world behind. I honestly don’t know where I’d be without these women in my life. They inspire, encourage and bring loads (and LOADS) of laughter to my life. There is a wall in the house where we have left mementos of previous years’ retreats. 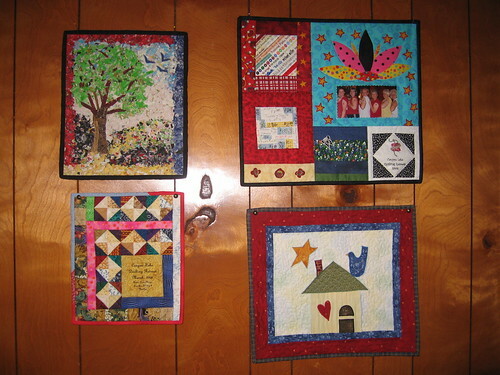 So far, all of them have been made by Shirley, one of the wonderful ladies in my group. This year, Shirley issued a challenge. We were all to make a 6″ block out of our communal scrap basket. 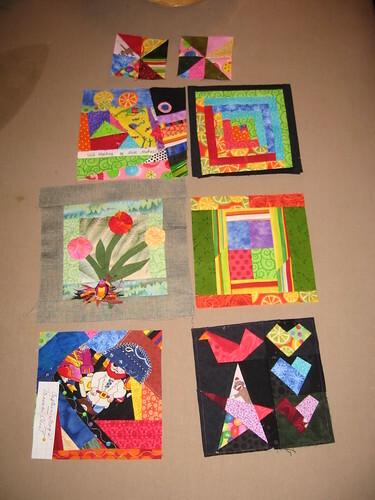 These blocks will go into a quilt that will hang on the wall next year. On the last night of retreat, we all set to work. The basket of scraps was dumped and we started to choose fabrics. We were unusually quiet as we went about planning our blocks. I pulled out my graph paper and started to draw. Normally, I design my patterns in Photoshop, so hand drawing my pattern was a challenge in itself. After about 20 minutes of sketching, I was ready to sew! We sewed, and sewed and were very secretive about what we were doing! We waited a respectful distance to use the ironing board, holding our blocks close to us so no one could see. The whole plan was for what we made to be a surprise. Even though we’d planned to take our time, none of us did, and a small work-frenzy took place that lasted no time at all. When the last one of us said “done” we shared our work. We all had fun with our Block Challenge and loved seeing what everyone made. There’s an inside joke here and there in the blocks, not the least of which are the giggles surrounding the projects these scraps came from. Now, I wonder what we’ll make next year? In honor of these wonderful ladies and the fun we always have at retreat, I’ve named my 6″ block Bee-Treat. 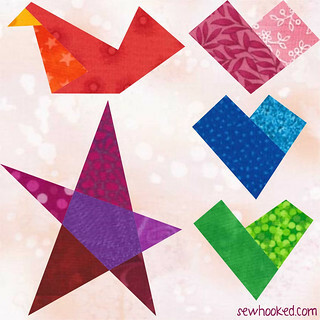 If you make any pattern or craft from Sewhooked, I’d love to see a photo. Add it to the sewhooked flickr group for a chance to win a prize! 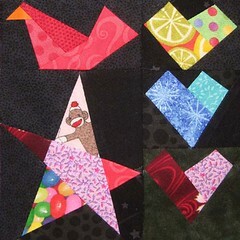 This entry was posted in paper piecing, quilting and tagged bee, bird, foundation piecing, heart, paper pieced, paper piecing, retreat, star on May 3, 2009 by Jennifer Ofenstein.